Oklahoma Gov. 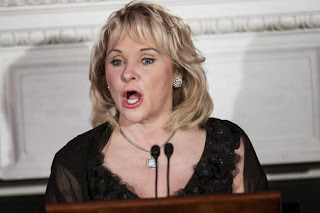 Mary Fallin said the words 'Common Core' are so divisive they've become a distraction. Oklahoma Gov. Mary Fallin, who heads the National Governors Association, signed a bill to replace the Common Core State Standards in Oklahoma. Oklahoma and South Carolina have officially joined the ranks of states that have ditched the Common Core State Standards. Oklahoma Gov. Mary Fallin, a Republican who has supported the standards, signed HB 3399 Thursday afternoon, which requires the state to return to the standards in place before Common Core was adopted in 2010, and the state board of education to develop "new, more rigorous standards," by August 2016. In South Carolina, Gov. Nikki Haley, a Republican who has been an outspoken opponent of the standards, signed a bill May 30 that seeks to replace the standards for the 2015-16 school year. Common Core will still be used in South Carolina for the coming school year. “[Common Core] was intended to develop a set of high standards in classrooms across the nation that would ensure children graduated from high school prepared for college and a career in an increasingly competitive workforce. It was originally designed as a state-lead – not federal – initiative that each state could choose to voluntarily adopt," Fallin said upon signing the bill. “Unfortunately, federal overreach has tainted Common Core." The American Principles Project, which has led a grass-roots effort opposing Common Core, applauded Haley's decision to sign the repeal bill. The group has also stepped up the intensity of its calls for Fallin to officially repeal the standards. On May 30, the group presented Fallin the signatures of nearly 8,000 people urging the governor to repeal the standards, as well as a copy of the letter the individuals signed. The letter claims the standards "have caused profound harm to our constitutional structure." However, the just days before the signatures were delivered, the National Association of State Boards of Education sent a letter to Fallin, describing its concerns that the manner in which the standards would be replaced could violate the state's constitution because it requires new standards developed by the board of education to be subject to the review and approval of the legislature. Still, Fallin said she could not ignore the concerns of parents, teachers and legislators that adopting Common Core would jeopardize the state's local control of its schools. "The words ‘Common Core’ in Oklahoma are now so divisive that they have become a distraction that interferes with our mission of providing the best education possible for our children. If we are going to improve our standards in the classroom, now is the time to get to work," Fallin said in a release. "For that reason I am signing HB 3399 to repeal and replace Common Core with Oklahoma designed and implemented education standards. I am committed, now more than ever, to ensuring these standards are rigorous." The two states join Indiana, which in March was the first state to officially un-adopt the standards. Several other states are considering legislation to delay the implementation of the standards or do away with them altogether. In Missouri, a bill to replace the standards passed through the legislature and is on Democratic Gov. Jay Nixon's desk awaiting a decision.